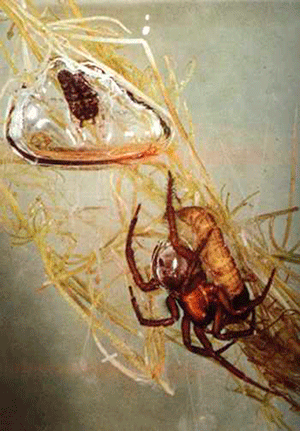 One of the amazing spiders designed by God is the Diving Bell spider, also called the water spider. Even though the spider depends on air like all air-breathing creatures, this spider is able to spend long periods of time under water. How? It creates its own oxygen tank! Here’s how he does it: the spider first produces silk threads to spin webbing into a dome-shaped cocoon that is anchored to pond weeds underwater. Then he surfaces to collect a large air bubble. He holds the air bubble between the special water-repelling hairs located on his abdomen and rear legs. He then inserts the bubble inside the webbing that he created to form a sort of umbrella for the air bubble. Voila! An underwater air chamber—a diving bell if you will! The spider enters the “bell” from the bottom and breathes the air of the bubble. From this location, the spider awaits prey that touches the webbing. When he feels the vibrations of the silk threads, the spider rushes out, snags the prey, and pulls it into the gas chamber for a tasty meal. As the spider breathes in oxygen, nitrogen increases in the bubble, but diffuses through the bubble wall, causing the bubble to shrink. So, after about a day, he must resurface to collect more oxygen for his bell. Researchers think that being able to stay so long in his bubble serves important purposes. For one, it helps to protect the spider from predators. Also, it allows the spider to remain hidden from prey that comes near. Obviously, this spider, and its ability to create a “diving bell,” could not have just happened—or evolved over millions of years. Such thinking makes no sense! Instead, the only adequate explanation for such complexity is that God designed this spider with its amazing abilities. Proverbs 30:28—“The spider skillfully grasps with its hands.” “God made…everything that creeps on the earth” (Genesis 1:25). God is an incredible God!